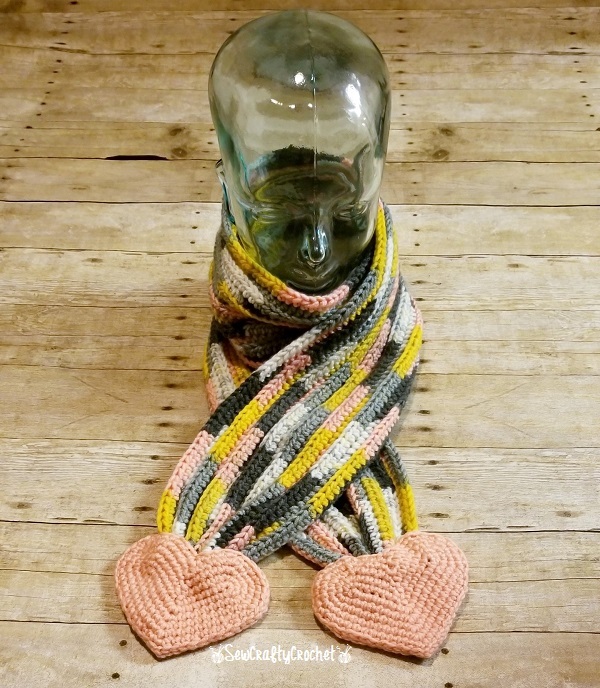 The yarns I used to create this scarf are Big Twist Premium in Salmon and Misfit Stripes. 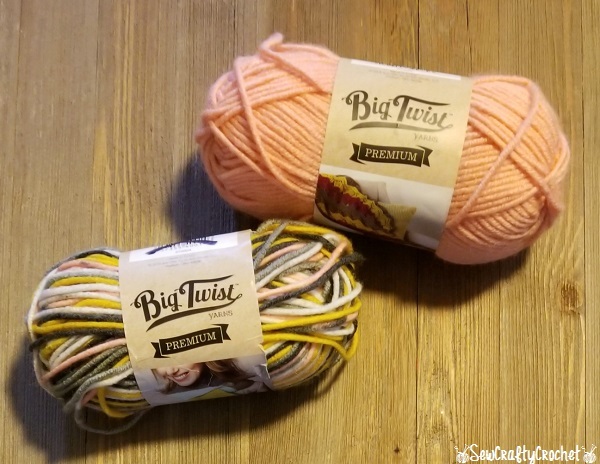 Unfortunately, Big Twist Premium yarns have been discontinued. This was one of my favorite yarns to use. 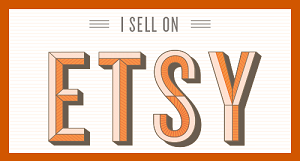 I use it to make my pencil scarves. 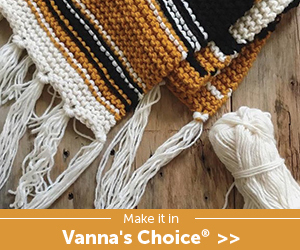 For the Hearts & Stripes Scarf, you crochet rows of half double crochets. 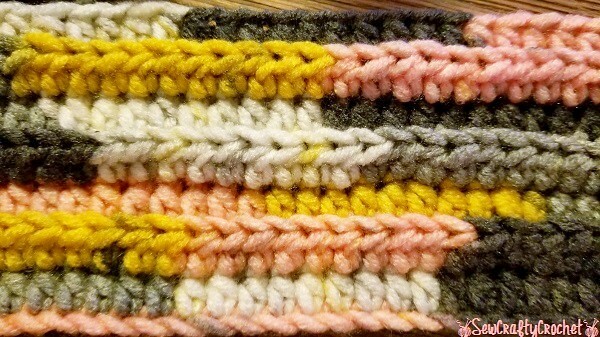 I decided to crochet the half double crochets in the back loop only for each row. 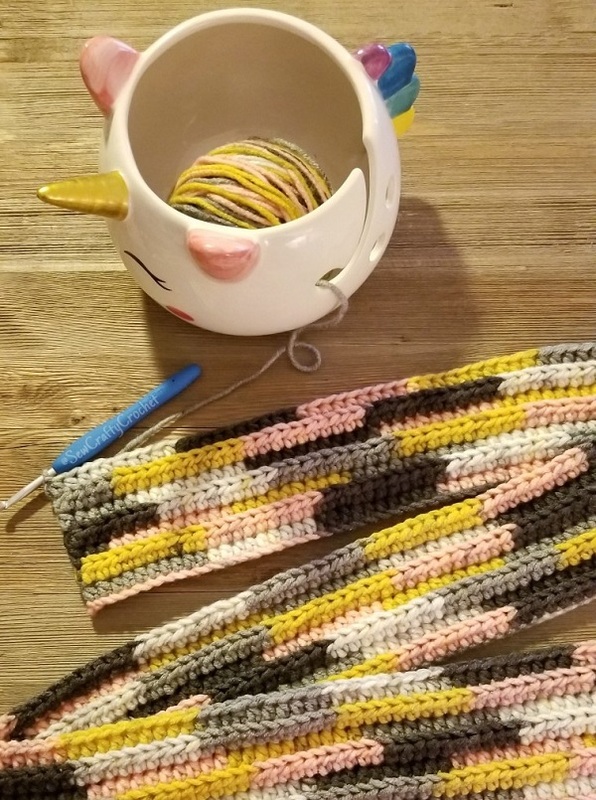 I really enjoy using my unicorn yarn bowl ! I crocheted this scarf with a size H/5mm crochet hook . 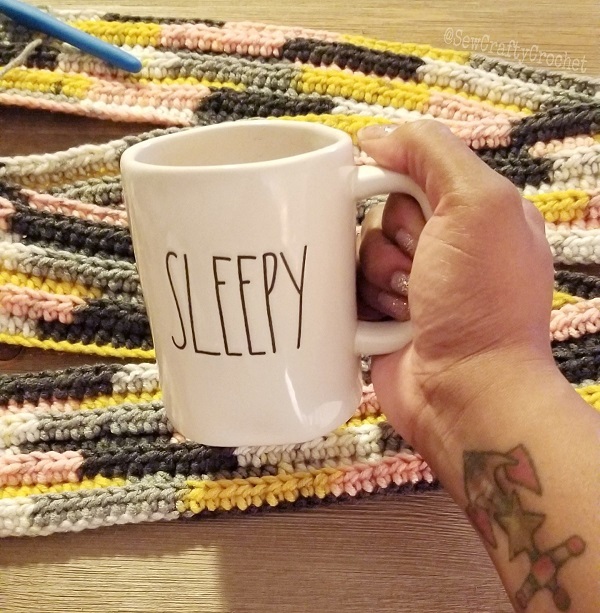 I often drink coffee, tea, or hot cocoa while crocheting in the evenings. I crochet until I get too sleepy and can't crochet anymore. I love my new Rae Dunn Sleepy Mug . 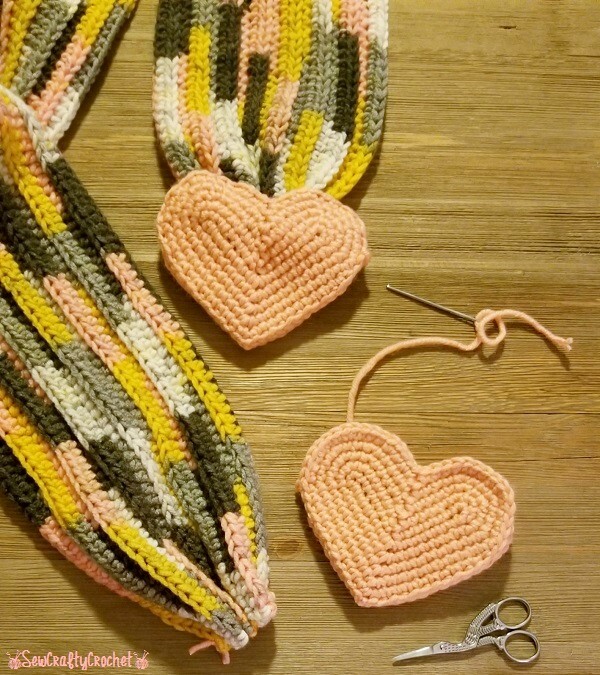 Once I finished crocheting the scarf, I followed the instructions in the Hearts & Stripes Scarf pattern to crochet four hearts with the pink yarn. 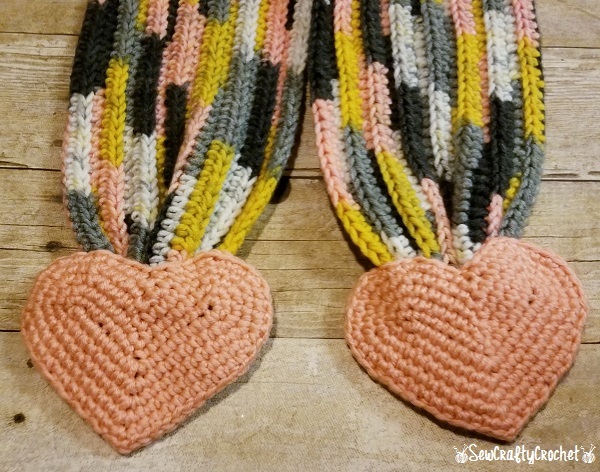 After crocheting the hearts, I gathered the ends of the scarf. I stitched two hearts together and left the tops of the hearts open to sew onto the scarf. 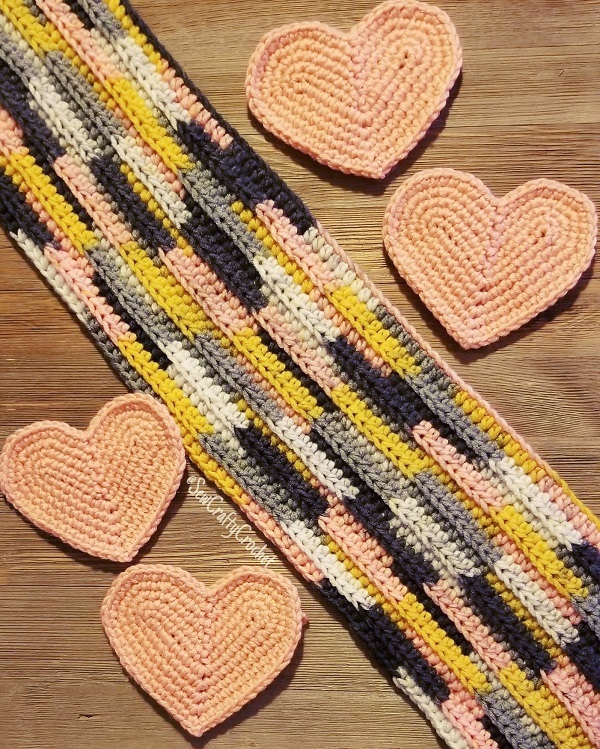 I like the idea of having hearts on the end of this scarf, and I think it's perfect for Valentine's Day. This scarf is all done and ready to wear. 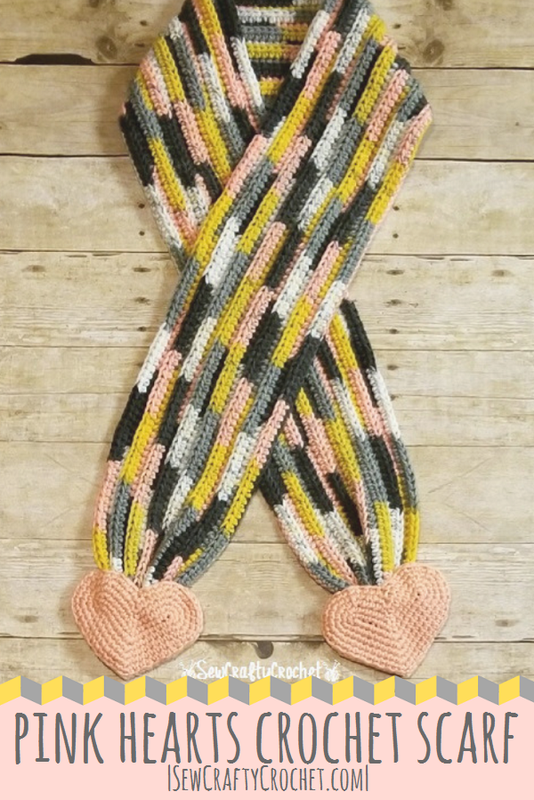 Since the yarn I used to make it is discontinued and I absolutely love it, I'm keeping this scarf for myself! 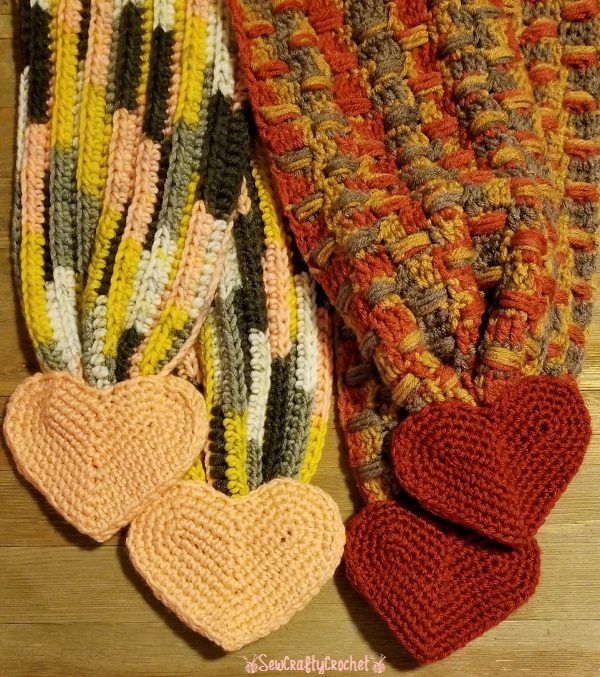 I recently shared another scarf with hearts on the ends (Autumn Hearts Scarf). 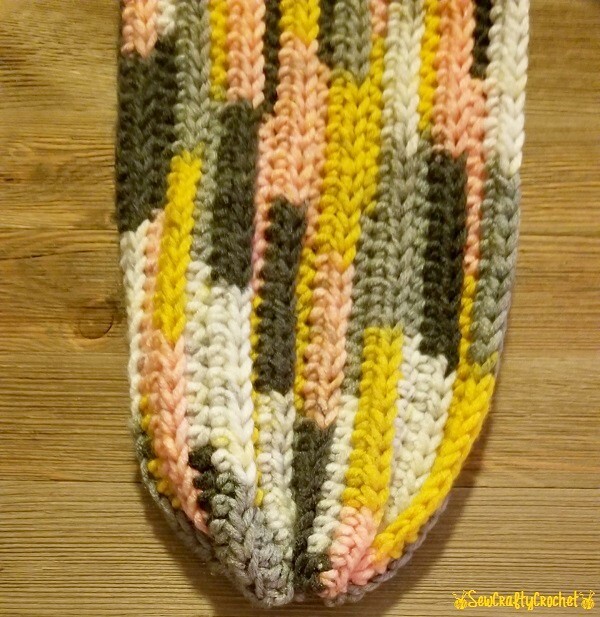 The colors in the variegated yarn remind me of the colors I used to create my Pencil Scarf. I love all your scarves, they are so pretty! I always drink coffee when I craft, it's the perfect combo. Another great Rae Dunn Mug, I'm jealous! Such a cute scarf. 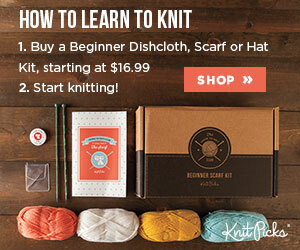 I just love the color pattern of that yarn. Pinned. The colors you selected for this are lovely! 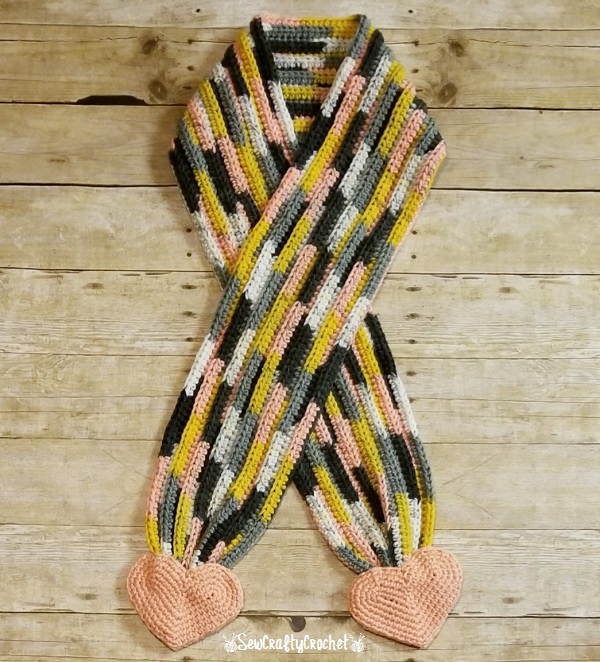 What a fun scarf for Valentine's Day! Pinning. 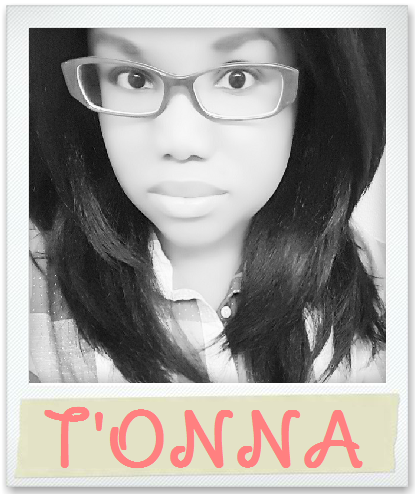 I was just going to say that the colorway reminds me of a pencil, hehe. Cute! 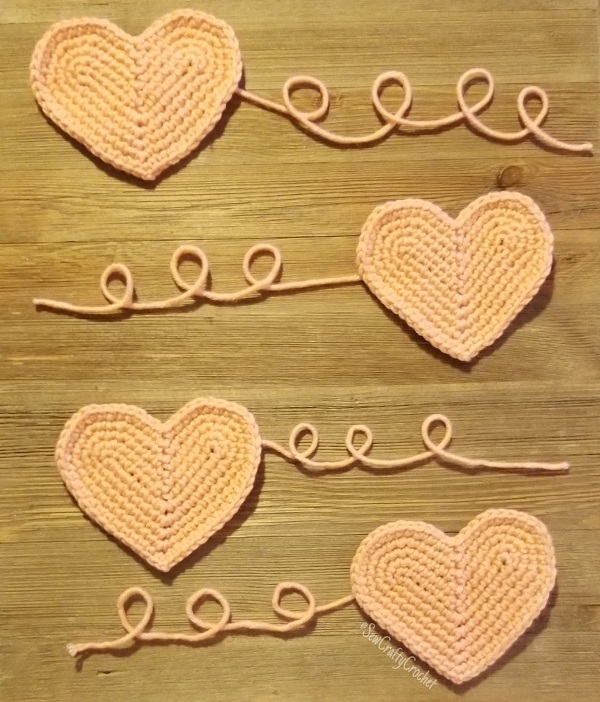 The colors of the yarn is perfect for Valentine's Day. I also like that it doesn't have red, so it can be worn all year without screaming V-day. 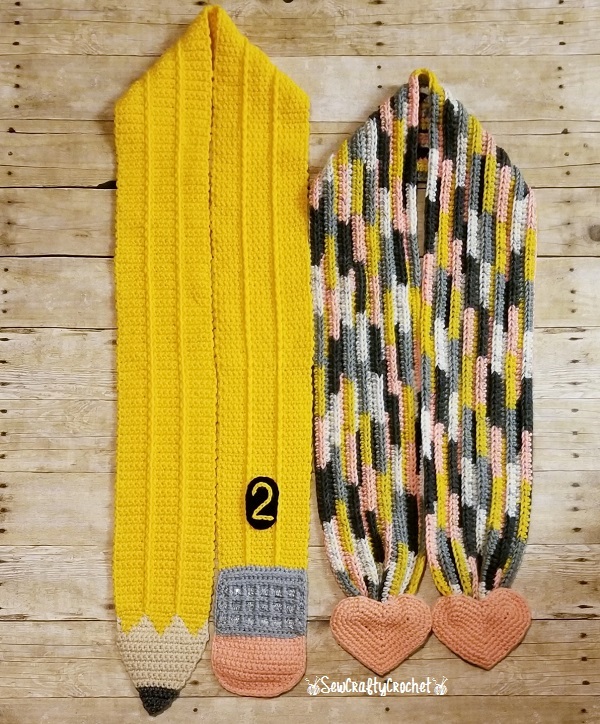 I love the yarn colors you used for this adorable scarf! The hearts at the end are great for Valentine's Day, but really this could be used all the time. Pinned! Oh, I really like the color ways of that yarn! I actually saw it in the store and wasn't sure about it, but love it now that I see it in use! Pinning!